Lori Skvarch Plays Fine All Instrumental Button Box Accordion! PolkaConnection.com is proud to bring you this new CD with Lori Skvarch. 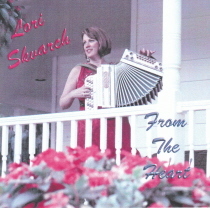 Lori plays a fine button accordion on this CD entitled “From the Heart”. The entire CD is Instrumental Button Box Accordion! Don’t pass this CD today! Lori Skvarch started playing the button box at the age of seven, studying first with her grandfather and father, later with the late Mario Mosti. After being asked to appear with the Jimmy Sturr Orchestra on RFD-TV, she decided to produce this CD. This CD contains 12 tracks including 6 originals.